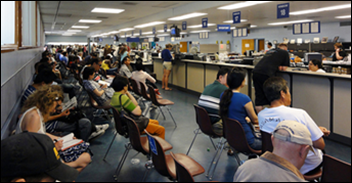 I recently spent some less-than-quality time at my local Department of Motor Vehicles office. Since the lines were long, I had the opportunity to observe many of the processes that were occurring, coming to the realization that some of the issues we are battling in healthcare IT aren’t unique to our industry. The first thing I noticed was a confusing registration kiosk, which had been implemented since the last time I was there. There wasn’t any clear signage to direct people to the registration kiosk, so people came into the building and stood there looking for the old “take a number” dispenser without much luck. Eventually other waiting patrons would direct people to step up to the kiosk, and then you could see more confusion occur as they tried to figure out how to use it. When I approached the kiosk, I could see that it was designed to handle two different registration processes (titles and vehicle licenses vs. driver licenses) and the language on the screen was ambiguous, resulting in a post-it note at the bottom of the screen that provided additional instruction. Once you registered, it printed out a number slip, but the printer wasn’t anywhere near the kiosk; it was instead mounted around the corner on the half-wall supporting the service counter. How many times in healthcare IT do we implement new technology but fail to change the physical space to maximize adoption? I have nightmarish visions of all the physicians I’ve watched juggling laptops on their actual laps, because they don’t have an adequate surface on which to use it while also facing the patient. Have you ever seen a computer on wheels that’s on a cart so big it barely fits through the doorway, leading nurses to leave it parked in the hall rather than bring it into the patient room? How often do we ask users to navigate a poorly designed system that requires external “job aids” and “cheat sheets” to know what to do because it’s not obvious from the screens? I made it through the registration gauntlet, but then had to listen carefully to the numbers being called because they were using the same number series for both driver licenses and vehicle licenses. It wasn’t always clear whether they were calling “number 8 for titles and licenses” or “number 8 for driver licenses” and so on. As I tried to observe the flow, I was even more confused by the fact that the “titles and licenses” clerks were subdivided into those that only did vehicle and boat licenses, and those that could process vehicle licenses and titles but not boat licenses. It took me at least a couple cycles to figure out which staff members were working on which issues. It reminded me of situations I’ve seen in hospitals where patients have to visit with multiple registrars to get situated prior to a laboratory or radiology procedure, depending on what kinds of services they needed. As the patient, it makes one feel shuffled around and that your needs aren’t being met, and as a consumer at the DMV I didn’t feel any different. I also had the opportunity to watch the clerks try to straighten out several customer service issues, where patrons didn’t quite have the right information they needed to complete their transactions. Several of them involved elderly individuals trying to obtain driver licenses in a new state of residence, who might be missing a critical form of ID such as a birth certificate or Social Security card. More than once I heard clerks asking customers if they had their “red, white, and blue” card with them, which I quickly figured out was the Medicare card. In the absence of a Social Security card or proof of SSN, they were accepting the Medicare card as a proxy. I couldn’t help but wonder if anyone was educating the DMV about the Social Security Number Replacement Initiative, which is now called the New Medicare Card initiative. Certainly DMV staff will need different scripting when the new Medicare cards hit the streets, and I’m sure there will be an uptick in customers making multiple visits to get their licenses squared away. While waiting, I noticed that they had installed a video screen that was supposed to display helpful information about your visit, not unlike educational programming in a physician or hospital waiting room. However, they had the screens set to advance so quickly that it was difficult to read all the content on the screen, requiring multiple cycles through the information to be able to absorb it all. I’ve done similar work for medical practices, both in the waiting room context and with employee workstation screensavers. I’m pretty “DMV literate” but I still couldn’t follow all the information they were trying to impart. It got me thinking about whether organizations are adequately considering elements such as health literacy and accessibility when delivering this kind of information. When I finally made it to the counter, I had some extensive back and forth with the clerk, who tried her best to try to convince me that I didn’t need to file the forms I was there to file. It reminded me of my recent journey through trying to get approval for a colonoscopy from my insurance, who couldn’t see past the fact that I am not yet at the “typical” age for the test. Both clerks were so stuck in policy and procedure that they couldn’t see the documentation being put before them so that they could do what was right for the patient/customer. In both cases a supervisor had to be called, with the information repeated multiple times to different staffers, only to ultimately accomplish what was asked for in the first place. How many times do we see this in healthcare, where rules often cost us efficiency and patient satisfaction? Even though I had convinced the supervisor to file my paperwork, I still wasn’t convinced that the state would mail me what I needed in four to six weeks as promised. I wasn’t sure that the information I provided had been keyed in accurately or that it described my situation, and just had to hope for the best. It was like sitting and waiting for your Explanation of Benefits statement to see if your procedure was going to be covered after all or rejected. Barely a week later, I was pleasantly surprised to receive my finalized documentation in the mail, exactly as I had expected it. Much like healthcare, despite the barriers placed in front of us, we still get good outcomes. It’s just a shame there has to be so much chaos leading up to the end point. What other parallels to healthcare do you see in other industries? Are they solving the problems better than we are? Email me. Jayne, many top tier Academic Medical Center’s are island’s of clinical excellence, surrounded by the Department of Motor Vehicles. It’s a sad commentary when we compare the US Healthcare to the typical DMV, but the parallels are undeniably present. I spoke with a CIO last week who’s come face-to-face with the “complexity burden” IT systems, documentation and reporting place on caregivers and physicians, some of it through organic evolution of sub-optimized systems (think bolt-ons-on bolt-ons) and some through increasing regulatory requirements (i.e., reporting-about-your-reporting). His organization is wisely going through a comprehensive assessment and review of their EHR system and workflows to streamline systems, screens and processes wherever possible. Perhaps in a year or two, he’ll be coaching the DMV on how to do the same. We can only hope. I love reading Dr. Jayne. Her writings are practical, helpful, provide usable concepts and practices to consider, and just plain make sense. Health IT is drowning in rhetoric and superficial cant. Keep up the good work, Dr. Jayne! Dr. Jayne – I believe that the workflow and patient experience innovation already exists. As an industry, we just do a poor job of sharing what others are trying and where they are achieving results. If we were better at this, others could adopt it and as an industry we could take gigantic leaps in improvements, rather than repeating the same mistakes over and over. For example, Wake Forest Baptist Health leverages a software app that let patients know what their expected wait times are based upon the specific and actual flow of the area they are waiting to see. This gives them a way to avoid the anxiety raising stay in sometimes overcrowded waiting areas. Further, they employ a related app that allows the patients to provide instantaneous feedback on their experience. These things exist, and solve the very real issues that you describe. How do we better share these innovative ideas so that the industry can improve more rapidly?